4½ inch high lens cone suitable for mounting 150mm enlarging lenses on Omega D-2 and D-II enlargers. 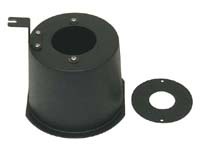 These lens mounts are supplied complete with filter holder mounting bracket, lens disc, and lens disc attachment screws. The lens mount will be supplied with a #421-001 Lens Disc with 39mm hole unless a different lens disc is requested. Other lens discs are available to accommodate lenses with 25mm, 32.5mm, 42mm, 50mm, 53mm, and 55mm mounting threads. Please contact us regarding custom sizes. Note: Lens discs are not threaded - a retaining ring or lens flange will be required to mount the lens to the disc. If you require a retaining ring or lens flange, it may be purchased separately.